At 2.5 out of 5 stars, I wasn’t totally impressed with the Florastor probiotic supplement. I was expecting more from this product because it’s one of the better-known probiotics out there. The directions suggest taking 1 capsule in the morning and 1 in the evening. It states you can swallow the capsule whole or open up the capsule and sprinkle the contents into liquid or over food. Some of the only positive qualities I saw in Florastor are that it’s supposedly safe for children 2 months and above and it doesn’t have to be refrigerated. This does make it more stable and easier to travel with. What I don’t like about Florastor is that it’s incredibly expensive. $50 is a lot for a probiotic and I don’t think it lives up to the high cost. Something I find strange is that there isn’t an actual cell count listed anywhere on the product, it only says that there is 250mg of the probiotic strain. I like probiotics more when they clearly list the cell counts. This probiotic also contains lactose and soy, so it isn’t allergy friendly. This product also comes in a clear bottle, which is a little strange for a probiotic. Light tends to be very bad for them and can render the strains inert. So overall, I didn’t like the high price tag, allergy concerns, and side effects but I did appreciate that it’s supposedly safe for kids and can be taken in a capsule or powder form. 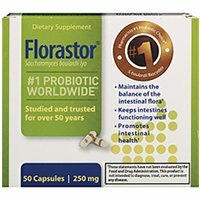 Florastor has 250mg of Saccharomyces boulardii lyo, which is the only probiotic strain included. This probiotic strain is meant to help balance the body’s bacteria levels and promote a healthy digestive tract. Saccharomyces boulardii lyo may also help to regulate bowel function. This strain may possibly be beneficial while taking antibiotics because it may help alleviate diarrhea that’s normally associated with taking antibiotics. Some research suggests that Saccharomyces boulardii lyo may also help lessen the appearance of acne. Florastor Probiotic is not allergy friendly. The capsules contain LACTOSE and trace amounts of SOY. These are two big allergy concerns. This probiotic is gluten free and vegetarian, though. The capsules DO NOT contain: corn, meat, egg protein, milk protein, fish, nuts, or shellfish. The other ingredients within this probiotic are magnesium stearate, hydroxypropyl-methylcellulose, and titanium dioxide. For a 50 capsule bottle of Florastor, it will cost you $49.99. The directions say to take 2 capsules daily, so this ends up being $1.99 per day. This is incredibly pricey, around 3-4x more than your average, daily probiotic. I wasn’t very impressed with this product so I can’t say that it’s worth nearly $50. I think there are better probiotics out there for your money. Unfortunately, I did experience side effects while taking Florastor. I didn’t think I was going to see any adverse effects, since it’s supposedly safe for kids 2 months and above. I was wrong though. I had a stomachache while taking these supplements. Probiotics can affect people in different ways; so I may have just been an unlucky one but do keep this in mind if you have a sensitive stomach. Florastor doesn’t offer a satisfaction or money back guarantee. Some sort of guarantee would’ve been appreciated since this is such an expensive product. To buy Florastor Probiotic, click here.